The ability to keep a child rear-facing to 40 lbs is an exciting feature of the Safety 1st Complete Air 65 convertible car seat. Even more exciting, though, is the Air Protect side-impact air cushions that are designed to dissipate crash forces around your child's head in the same way those giant, air-filled stuntman cushions protect movie guys who need to jump from great heights to film scenes. The Safety 1st Complete Air convertible car seat was the first car seat released with the new Air Protect side impact protection system. This system was developed in partnership with Kettering University's Crash Safety Center and was the first to be tested with their "intruding door" side-impact crash test. This crash testing method mimics the amount of intrusion from the vehicle door in a side impact crash, and the company has asked NHTSA to consider making this method the federal side-impact crash test standard. Air-filled pillows on either side of the child's head divert crash forces away from the head by controlled release of air through tiny holes in the cushions. Lowest rear-facing harness position is 10.5"
Highest forward-facing harness position is 17"
The standout feature of the Safety 1st Complete Air 65 car seat is the Air Protect side-impact protection system. As of 2016, the intruding door testing method used with the Air Protect system and the Complete Air 65 is still considered a front-runner to become the mandatory federal side-impact testing method in the U.S. The 40 lb rear-facing weight limit, when combined with the fairly tall car seat shell, should allow the majority of kids to remain rear-facing well past age two. Since research shows that kids are more than 5 times safer when rear-facing through toddlerhood, the additional height and weight capacity for the rear-facing position is excellent. It's convenient that you don't have to unthread the harness to adjust the height, and it's not difficult to get the hang of twisting the tabs at the top to adjust the height. The harness adjuster tail is set high enough on the front of the car seat that it doesn't easily get trapped against the vehicle seat when rear-facing. The Safety 1st Complete Air car seat is very easy to install in the forward-facing position. 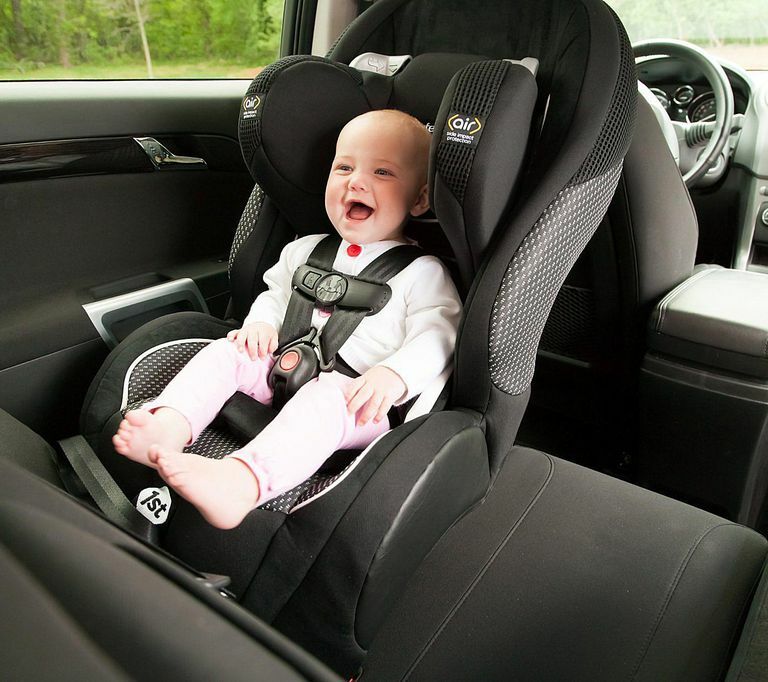 The forward-facing belt path is easily accessible and the car seat fits most vehicles very well in this position. The foot on the bottom folds easily between recline and non-recline positions. The push-button LATCh connectors make it very easy to snap the connectors onto the lower anchors in your vehicle. They're easier to remove in a tight space than the cheaper clip-style connectors, too. There are also LATCh storage hooks on the car seat shell. The biggest drawback is the difficulty in rear-facing installations. The rear-facing belt path is awkward to get into, and getting the belt through may require removing the bottom portion of the cover. Once the car seat is against the vehicle seat, though, it's difficult to get the cover properly wrapped over the front of the car seat again. All of the belt paths have rough edges that can scrape your hands. The awkward rear-facing belt path plus the way the armrest area curves out makes it difficult to pull the LATCh belt at the correct angle to get it tight enough. This seat is difficult to install correctly rear-facing in some vehicles. That means parents with little car seat experience may struggle to get it right. For younger babies, you'll likely need to use pool noodles or a tightly rolled towel to get the recline right. The height of the seat means that the vehicle seat in front of it may need to be moved up a lot, especially in smaller cars, when the Complete Air 65 is fully reclined. This problem is not so noticeable when the car seat can be less angled (30 degrees vs 45) for older babies. The headrest can be difficult to lock into the uppermost position. Should You Buy a Safety 1st Complete Air 65 Convertible Car Seat? If your primary consideration is a car seat with added side-impact protection that allows extended rear-facing, the Safety 1st Complete Air 65 car seat is a reasonable choice. The price is great for a car seat with these features. However, you should make sure you're comfortable with the proper rear-facing installation in your vehicle before buying this car seat. If you're considering using a convertible car seat right after your baby is born, instead of starting with an infant car seat, the 10.5" bottom harness slots on the Safety 1st Complete Air may be problematic since they need to be below baby's shoulders when rear-facing. For families who are willing to go to some extra effort to be sure it's installed correctly, the Safety 1st Complete Air 65 should perform as well as other car seats in this price range.